Up to this point I hadn't considered teaching my preschool aged daughter how to tie her shoes. For one thing, she wears shoes with Velcro straps. Also, I myself learned to tie my shoes in kindergarten, and I guess I thought I'd wait until she turned 5 to start teaching her. I never realized that some younger kids do possess the motor skills needed to tie their own shoes, and a new product called Tie Buddies can help. Just recently we had the chance to test out the girl version of Tie Buddies. 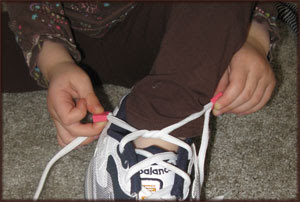 According to the website children ages 3-9 can learn how to tie their shoes using this fast and easy method for teaching the tying skill. Tie Buddies are special tabs you thread onto the shoe laces. Children grasp the tabs and don't have to worry about making their own loops to tie the bow. By following the simple step-by-step directions provided on the packaging (a modified bunny-ear method), parents and educators can teach children how to tie faster and without as much confusion. Since my 4-year-old daughter doesn't own any lace-up shoes, we put the Tie Buddies on a pair of her daddy's shoes. I slowly helped her through the steps and with a little assistance she excitedly made a bow. Even thought she lost interest after a few tries, the tabs did make the process of teaching tying a lot easier and more understandable. Within the next year I plan on purchasing a pair of lace-up shoes for her so she has a little more incentive to learn this essential skill. We will try the Tie Buddies again then. Just one point worth mentioning -- I tie my shoes using the one-loop method, so it took me a couple extra seconds to familiarize myself with the method used by Tie Buddies. Fellow FRN reviewer, The Mud Bug, has posted a great video if you want to see Tie Buddies in action. Each set retails for $7.95. 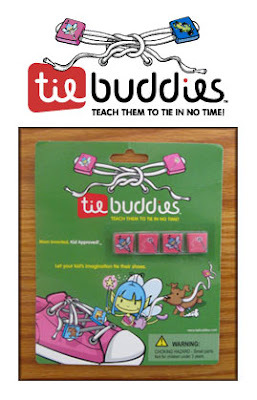 Visit www.tiebuddies.com for more information. The Tie Buddies website features two special story ideas you can use to help your child remember the steps. Win Tie Buddies! Tie Buddies has kindly offered to give one Brimful Curiosities reader a Tie Buddies package. To enter, leave a comment letting me know which style (Boy or Girl) you'd like to own. • Contest ends on Monday, April 20th, 2009 at 11:59 PM CST. Thanks to Family Review Network and Tie Buddies for this review opportunity! With my girly girl we'd definitely want the fairy set. Oh, these would be perfect for my girls! Definitely the fairy set. What a great product! What an awesome way to teach your child how to tie shoes. My little one will be 5 in September I guess I better start working on this. The fairies and Magic wand style is so adorable! Thanks for the info. We'd love the girl set! My 3 1/2 year old wants to learn to tie her shoes! What a concept! I would have to choose the girl set. Here's where I tweeted about this. I follow you on Twitter as well. I just pulled out a pair of lace up shoes for my 4 year old boy in hopes to teach him and he quickly reverted back to the velcro. This looks like a great incentive to get him to learn. We'd like the cars style. Thanks! I would love to win the girl one..thanks! I'd love to win the boy set. Thanks! I would love the boy set as we're trying to teach our 4 year old how to tie his own shoes now! I'd like the boy's set. I'd like the red and green race cars! I'd love the race cars for my son! What a cool product! We're working on this right now at home with my daughter. She likes the race cars because they are blue - her favorite color! They are adorable and a great idea, I am interested in the boy set. My 4 year old son will definitely like the boy set! My son would like the car set. Mom with vision you created these. Race cars are cute, I would probably get these for my tomboy. I would love to win the boy set for my sons! I would LOVE either set for my triplets. (boy/girl/girl) I am having a heck of a time teaching them how to tie shoes, and this sounds helpful. Thank you for the opportunity!